I was looking through my portfolio, searching for paintings I might want to frame, when I came across this unfinished pastel of Carrog Bridge. 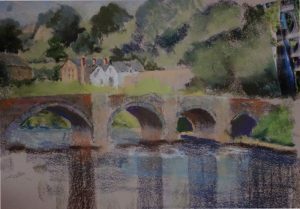 It was begun as a demonstration piece on using pastels, done about the time I was painting all those bridges of the Dee. This is not the view which made it into the book, but it’s still a good composition. The tonal blocks were laid in a pleasing (to me!) chunky manner, so that the scene was revealed in its essentials within an hour or so. There is rich colouring in the stonework of the bridge itself, while the pattern of darks and lights in the trees is lively, invigorating even. A sweep of a pastel announced the reflections. With all that in place, I had then started on the details on the houses. I must suppose that time had run out then, but I think there is a good basis for further work should time allow. It will be a new experience to paint a Dee bridge as a stand alone image, and it has encouraged me to re-visit my photographic archive to see what other treasures I can find. Lovely and chunky and painterly – a great start indeed!